Director of wildlife Tish Gailmard shows a male red wolf pup to media at Reflection Riding Arboretum and Nature Center on Wednesday, May 18, 2016, in Chattanooga, Tenn. The center has a litter of red wolf puppies, two males and one female, that were born on April 15. 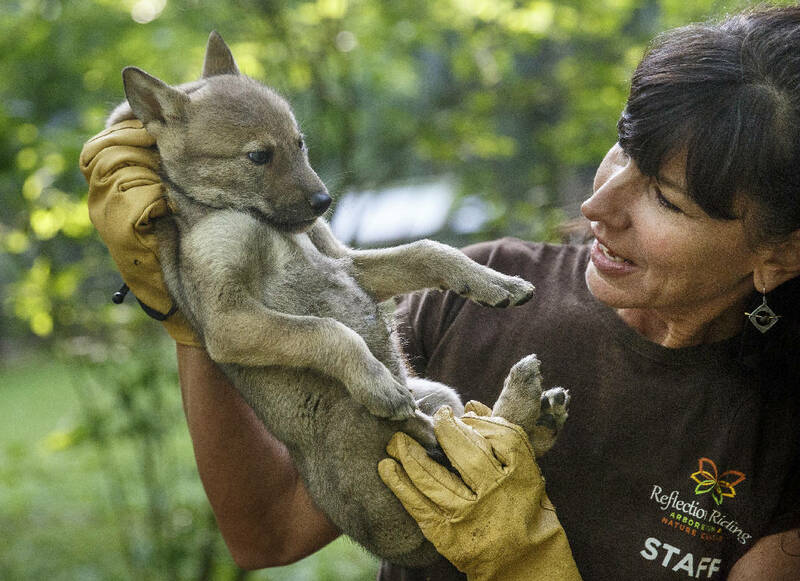 Clutching a pair of month-old male red wolf puppies in her arms on Wednesday morning, Tish Gailmard commented on their growth, a hint of sappiness in her voice. "This will probably be the last time we can hold them like this," Gailmard said to Reflection Riding Arboretum Nature Center co-worker Corey Hagen, who was holding the litter's third puppy, a female with a fierce glare and a feistier temperament than her brothers. There are just 45-50 red wolves left in the wild, making the birth of puppies like these at Reflection Riding a momentous occasion. The once-common but now critically endangered species has been a recent target of illegal poaching, even amid protection efforts as its numbers dwindled through the 20th century due to predator-control programs and habitat alteration. But with the efforts of Reflection Riding Arboretum and other participants in the Red Wolf Species Survival Program, there is hope that red wolves can thrive again and return to their natural role as an apex-level, ecosystem-regulating predator. "This is the eighth-most-endangered mammal in the world, and the most endangered mammal in the states," Gailmard said. "So it is quite a celebration to have babies." There are roughly 200 red wolves in captivity across 43 facilities in the species survival program. Each birth is a strategically orchestrated endeavor designed to diversify the gene pool of the species. "Ideally, we'd love to have 550," Gailmard said. "That's sort of a safety number. It doesn't mean they would come off the list. But they wouldn't be as critically threatened. But we have a long way to go to get to 550." The wild population resides on the Albermarle Peninsula in northeastern North Carolina, where they have restored balance to the ecosystem by regulating the raccoon population, which in turn has helped sea turtles thrive again. The Reflection Riding Arboretum puppies are unlikely to ever be released into the wild, but they may be distributed to other species survival program locations once they are ready to leave their parents. For now, they bring the nature center's red wolf population to nine and give Hagen, Reflection Riding Arboretum's director of education, an additional teaching tool for when school groups and campers come to visit. "Red wolves greatly affect the whole ecosystem of the southeastern United States," he said. "That's one of the reasons I like to teach kids about them. They hold a very special place."